Keter Cool-Bars are available in various designs including the ever-popular stylish rattan creation for the purpose of complementing many outside furniture sets as seen presented on many deck boxes. Some models elegantly display a smooth finish showcased in teal, grey and red etc meanwhile the classy cream shade two-tones with either a blue or brown interior to even one that’s illuminated. Different designs frequently enter the marketplace. The internals have a storage capacity of 30 litres / 7.5 Gallons, advertised to accommodate 40 12oz cans including ice. Many purchasers say it comfortably fits 4-5 bottles of wine, others mention tall bottles require titling to fully fit in however the dual lined walls are advertised to keep drinks at icy temperatures for approximately 12 hours. 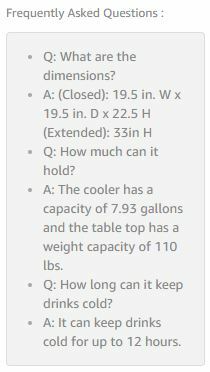 When the ice melts, rather than the hassles of fully extending the lid & lifting the table to empty, a drain plug situated at the bottom of the bucket simply requires unplugging. Once drained, a sanitised wipe-over fulfils the breeze of a cleaning program. 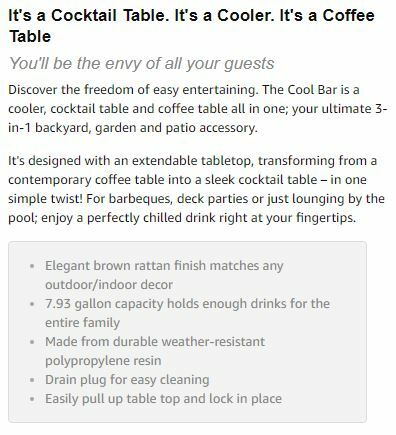 Reports flood back commenting how sturdy & level the Cool Bar satisfies the services for accommodating drinks & food meanwhile the table-top has a weight capacity of around 110 lbs / 50 kg. In the closed position the Cool Bar comprises approximate dimensions of: a 19.5 inch (49.5 cm) diameter and 22.5 inch (57 cm) height meanwhile fully extended, the height reaches 33 inch (84 cm). Extending the Cool Bar involves pulling the table-top upwards after a simple twist until fully ajar & tightening the centre-stem to lock the table in the expanded position meanwhile closing back down to the conventional table-top height entails reversing the explained procedure. Exceptional feedback generates through reviews, admiring the triple services. Along with flaunting sleek stylish displays, purchasers admire the way Cool Bar’s closed position stations the perfect height to accompany 2 chairs for serving as a bistro set or a contemporary side table during the day meanwhile expands to deliver the ideal cocktail bar height for parties on a night whilst chilling drinks below. 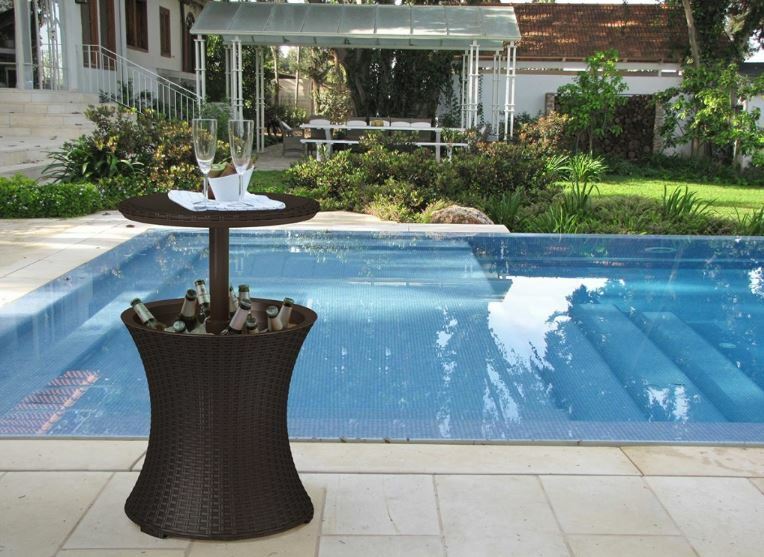 It’s a common occurrence to see sellers advertising a pair of Cool Bars nowadays due to their sleek versatile design stylishly serving chilled drinks at your fingertips meanwhile they compliment many outdoor spaces, from up above situated on an urban balcony to down below positioned on a barbecue deck, patio or poolside. Don’t forget inside either, located within a conservatory or summerhouse represents additional favoured spots. Constituting Keter’s benchmark regarding a polypropylene manufacture substantiates their environmentally friendly reputation, virtue of the entire composition being reusable. Who knows, at the end of the day this product maybe recycled into the next generation of Cool Bars, a nod of approval with respect to this sustainable plan of action. A polypropylene make-up withstands the process of decomposing therefore no matter what the elements throw down upon the Cool Bar or whether stationed in a damp environment, rest assured a rotting decline will never become an issue meanwhile a UV stabilisation process armours the composition from succumbing to fractures and colour fade when sunburn rays attack. As mentioned earlier, there’s the choice of either the craftily created rattan effect exhibiting a full-bodied curvy style or the various shades such as teal, grey, cream or red etc comprising a smooth finish whist fashionably incorporating 4 longer legs meanwhile the walls of both designs are formed into a twin lining for construction sturdiness along with providing a cool internal ambience for keeping drinks icy-chilled for up to 12 hours. There’ll be no need to paint nor re-varnish at a future date, the manufacture isn’t designed for conservation duties, rather the swiftness of a wipe down with a damp cloth fulfils the cleaning operation for the smooth finish, the rattan style may require an occasional soft brush-over with water & mild detergent to clean the wicker indentations meanwhile it’s always good hygienic practice to perform an anti-bacterial wipe-over inside after chilling drinks & draining the ice. Assembling Keter’s Cool Bar couldn’t get more efficient. Only the legs require installing onto the body whereby one screw per leg secured by a Philips head screwdriver fulfils the construction. After which, it’s ready for stationing in the desired spot for serving ice cool drinks whist you’re stood up or sat down. The only warning mentions: this is NOT a seat, rather it’s a height-adjustable table comprising an ice bucket for keeping beverages cool. It’s not designed for sitting on. Keter’s Cool Bar displays elegant swish looks in order to compliment any outside oasis, presented in either full-bodied curvy rattan styling or various striking shades showcasing a smooth finish. 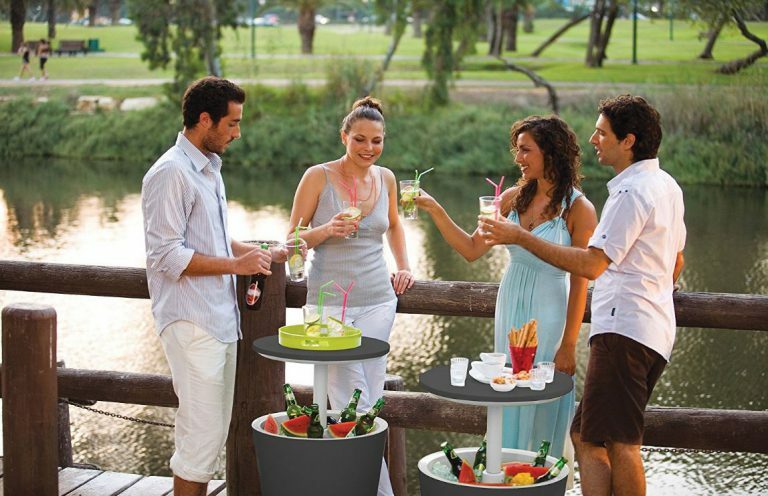 Located on a patio in the closed position, Cool Bar ideally serves as a centre, side or Bistro table for accommodating drinks on top further to alfresco dining meanwhile once the party or BBQ event gets into swing, twist the top to operate the telescopic support, raising the table to stand at cocktail bar height for the purpose of serving drinks at your fingertips. Meantime, fill the inner compartment with a load of ice and place the beverages in among, they’ll keep icy cool for around 12 hours. Once the ice melts, drain the water away by unplugging. Assembly & cleaning’s a cinch, the price is affordable meanwhile comments through feedback are quite exceptional. Hope Keter’s ‘outdoor table ice bucket’ delivers plenty of inspiration for keeping your summer drinks icy cool. Share your favourite design below along with any Cool Bar queries. Happy to help where we can. Please share Keter’s Cool Bar. Thank you. 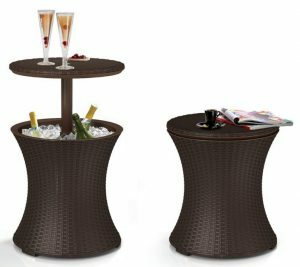 Hi, thanks for visiting to read about Keter’s stylish cocktail table/ice buckets. They provide a chic classy look to any home-yard’s seating area. In the main, they position as a coffee table surrounded by chairs only to be transformed into a cocktail bar for standing around when parties get rolling meantime keep tins & bottles of drinks icy chilled down below. There are a few models presently being designed, one comprises full-bodied rattan styling meanwhile others showcase various shades from soft to vibrant colours presented with a smooth exterior to enhance patio spaces. 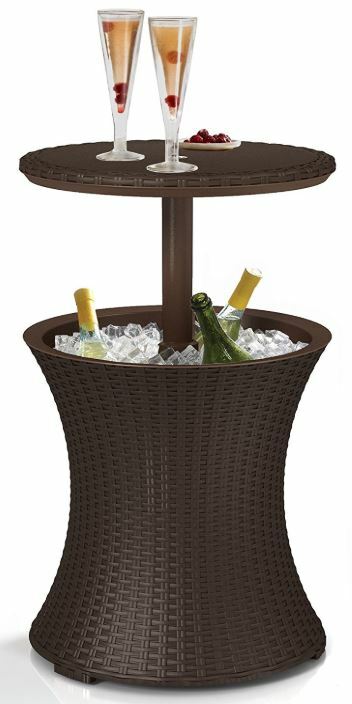 I was just Googling for an out door ice bucket, clicked here, and now I see they have merged these ice buckets with outdoor table ice buckets! What a great idea and it is definitely one less thing to trip over after a few in the garden summer months 🙂 . I am wondering now what is the delivery charge? I really need one for my garden because my old ice bucket, well, its got a leak, so its a bit rubbish. I love I can just stand or sit at these tables and not have to walk around for ice or a cold drink – now this is really a great product. Thank you so much for explaining the types and I read the whole lot to – now, I am very tempted to purchase one today. Thank you for this and now I am off to check prices. Hey Philip, thanks for visiting to read about the various designs of Keter Cool-Bars. 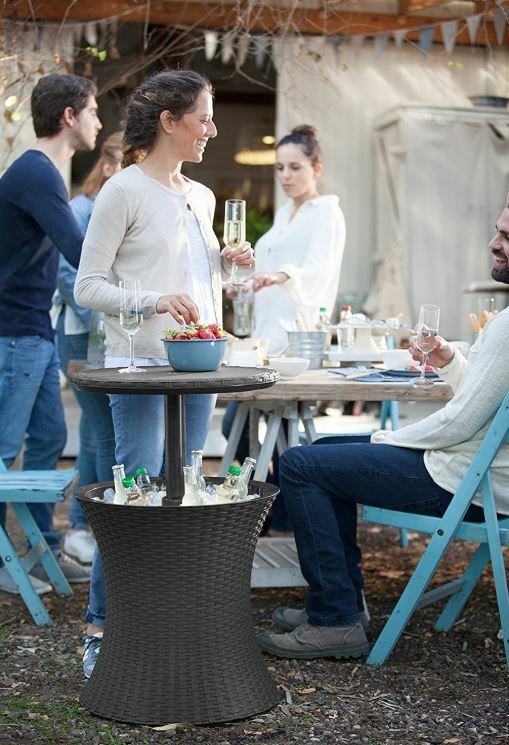 Keter Cool-Bars conveniently transform from a stylish weather-resistant coffee or bistro table positioned between chairs on a patio into a bar height to stand around & serve drinks at your fingertips meanwhile chill drinks icy-cool within the table-body. As far as delivery is concerned, sellers do vary. If you’re a Prime Amazon member, for instance, delivery is free. For non-members, if you want the item immediately, there’s usually an additional charge meanwhile most sellers on eBay to which I have also placed a link, offer free delivery. Ha! They’re too large to trip over meanwhile may steady you after you’ve had that extra sherry Philip – here’s hoping!! There are various styles including full-bodied rattan designs that complement most outdoor wicker furniture sets or smooth finishes exhibiting cream to radiant colour schemes for the purpose of enhancing a patio seating area. Simon this is excellent. I like the fact that it keeps your drinks cold for 12 hours. That’s awesome. It also makes for a great conversation piece and an even better, more stylish piece of furniture to add to any home. It really looks good. It kind of looks like something you would find at a very classy hotel or at a “cocktail party.” Either way, it’s very eye-catching. Hey Jake, thanks for stopping by to inspects Keter’s indoor/outdoor table ice bucket. 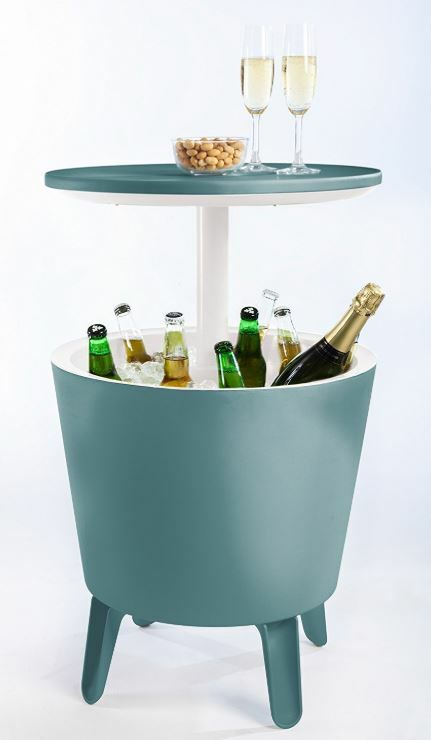 Keeping cans & bottles icy chilled for up to twelve hours satisfies most of our needs meanwhile like you say, the cool part about the Cool-Bar is the way the height transforms providing a conversation table to stand around and chat whilst drinks conveniently station at your fingertips. A convenient design, serving as a coffee table during the day & cocktail bar at night. I like the way they have designed this table showcased in various colour schemes along with a choice of a smooth or rattan finish, their different styles enhance any outside seating area whilst the rattan look complements the favoured wicker styles of today’s outside furniture, presented in full-bodied shape. Those are very stylish looking for any type of backyard get-together! Hi Tiffany, thanks for calling in to investigate the Cool-Bar benefits. Yeah, there’s a whole range of varied styles in either rattan or smooth finishes with plenty of colour choices to brighten up any outside seating area further to inside the home, conservatory or summerhouse. 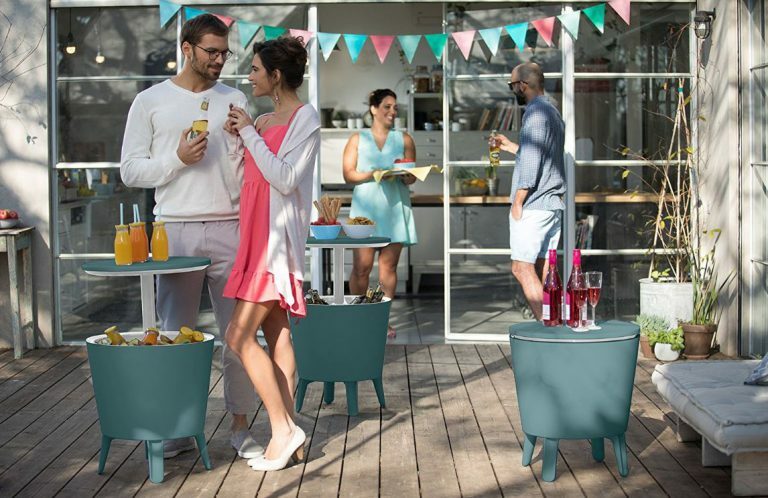 They become a get-together’s best friend once expanded to stand-up height for guests to chat around and locate their drinks meanwhile accommodating all the back-up beverages down below in an icy-cool temperature. These table ice buckets are actually very convenient and compact. I remember some similar designs showing up on Internet, which is kind of cool. I just wonder, these can be used at other events as well, not just the outdoor parties, right? Hey German, thanks for dropping by to examine the benefits of Keter Cool-Bars. In the main, most people with have the table-tops contracted flush with the ice-box body and located between a couple of chairs fulfilling a kind of bistro set-up or side/centre table between furniture meanwhile once parties get underway or friends visit and most guests are stood around is where their convenience comes into play. Having the ability to expand their height to serve drinks while your stood around the table makes them such handy accessories. Yeah, these Cool-Bar designs are no new invention, they’ve been around for quite a while however like anything progressive, especially in the innovative ways plastics are manufactured, compositions have evolved to comprise additional supplements like improved UV protection and superior molding methods to further enhance their exhibit of more realistic & charming appearances. They can be used for all kinds of events. A friend of mine has a couple located his in the conservatory where they’re used to serve chilled drinks whilst watching football. At times like cup finals and International matches, guests are plentiful. Having the ability to extend the top and accommodate drinks at bar height whilst chilling the next round beneath makes them ultra convenient for his concerns meanwhile like he says, draining the bucket along with hygienically cleaning afterwards takes minutes without hassles. You always leave me amazed with your awesome product reviews. Here you are again with an amazing product, you know what I can’t stop myself for buying such an adorable ice bucket. What a beautiful, elegant and classy it is. I will share your post in my friend’s community too because I know they all gonna love it. Keep sharing such a wonderful and beautiful product reviews. Hey Sarah, thanks for inspecting Keter’s outdoor table – ice bucket. I think these Cool-Bar designs deliver an impressively handy piece of kit to accompany any outside seating areas. Not only are they available in various styles & shades to compliment outdoorsy furniture & enhance patio spaces, they’re very reasonably priced plus assembly’s a snip. Couple those benefits with triple services, no wonder many sellers offer these as pairs. 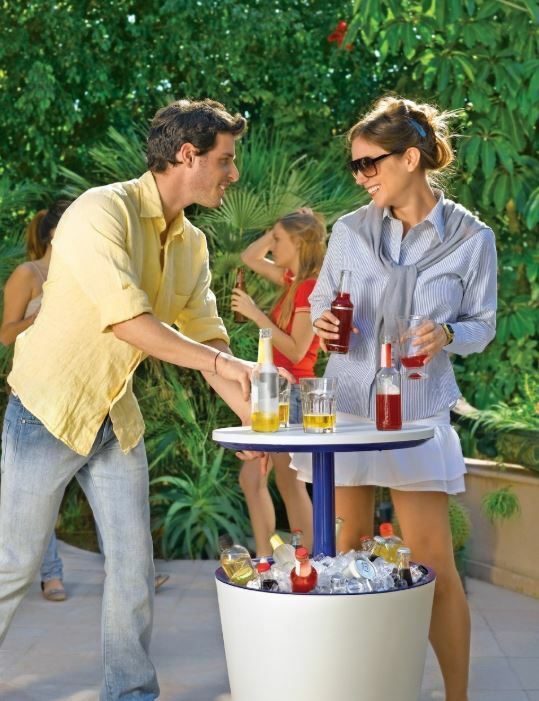 Your wording, ‘elegant’ best describes Cool-Bar’s appearance in my view however being able to readily transform from being positioned as a side table on a patio into a cocktail bar height to serve drinks at your fingertips whilst chilling bottles & cans below with one simple pull-up & lock delivers convenience especially for BBQ & summer evening parties. I think this is an amazing invention!!! Not just for outdoors…. How many times does the man of the house watch a sporting event on TV and thinks the fridge is too far away for another beer? These should replace side tables!!! Hi Travel and Treats, thanks for visiting to explore the benefits of Keter’s Cool-Bar. You’re right, this is an amazing invention and a popular one at that, across all shades including smooth to rattan finishes. There’s a style & colour choice to complement any outside seating area whether it’s located on a balcony or outside the backdoor within the home-yard meanwhile like you mention they have become a handy accessory indoors too. Sellers have loads of customer images of these Cool-Bars situated inside their home. Ha!! forget the living room’s nest of tables, now these Cool-Bars have entered the market. During a game of football, you can miss so much action walking out of the room visiting the fridge for top-ups for your mates. Perish the thought – you could even miss a goal!! Not anymore, the Cool-Bar can accommodate all your drinks below and keep them icy chilled throughout the match meantime giving you the option of using it sat down or stood around at cocktail-bar height with cans at your fingertips. Hi Simon, great review on the Cool Bar – it literally makes me want to get up and go to a place warmer than here right this moment! I am a fan of the rattan finish – it looks like a really sturdy, high quality piece of furniture. The features I like about it the most are its UV protection – there’s nothing more disheartening to see the expensive furniture you have purchased getting ruined in the sun! Also I like the drain, which makes for easy cleaning. It’s great that you can alter the height of it – 3-in-1 that’s always value for money in my book! I’m off to look at the prices…thanks! Hi Michelle, thanks for dropping by to read about Keter’s various Cool-Bar models. You sound as though you’re in cold wet England like we are as I write this reply. We’ve just had a few surprisingly warm days over a Bank Holiday weekend but it soon turned cold again, that’s UK weather for you. 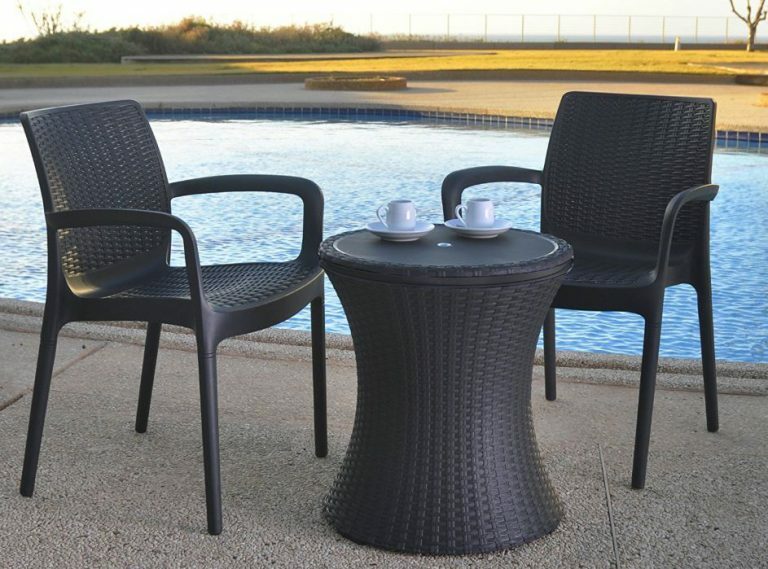 Both Cool-Bar styles are very popular however the rattan effect does compliment most outdoor furniture sets these days as the rattan style has become a favourable outdoor seating design. 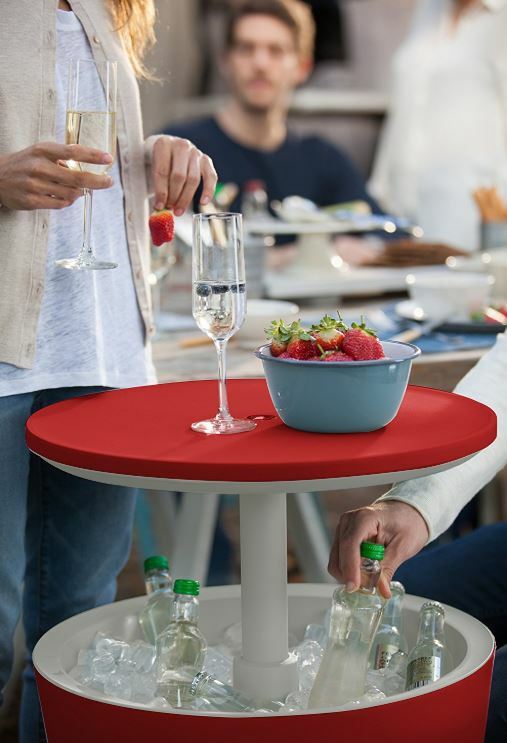 Reports come back strong how sturdy their constructions are for accommodating drinks on the table-top, virtue of the dual lined body walls which are also essential for maintaining a cool ambient temperature inside. To keep drinks icy chilled for up to 12 hours is pretty good in my book, especially for warm climates. All Keter products are protected from the sun nowadays alike many modern manufacturers, on account of stabilising the resin mix with a UV strengthening compound to armour the composition from the affliction of sun scorch stresses that once lead to fractures & colour bleaching on yesterday’s plastic. The drain makes it easy to empty once the ice has melted, simply by unplugging meanwhile a quick wipe over with an anti-bacterial solution or wet-wipe is best practice in my book to get shut of any potential germs. Yeah, the cocktail bar height serves drinks at your fingertips, they’re a great design. Bet you’re impressed with the inexpensive price too. It really is amazing the keter’s Cool bar. sounds interesting i would love to have one for my parties in my outyard. Hi Sumit, thanks for taking a read of Keter’s Cool-Bar. I like the way the table-bar delivers triple services by positioning as a side, centre or bistro type of set-up during the day which to be fair will be used most often thereafter expands into a cocktail bar height when parties get rolling meantime keeping drinks ice cool down below. Yeah, they’re such a convenient accessory to have located within one’s out-yard and look admirably swish too.